The making of this 32"x42" hologram is a good example of how the process works. It started when Jeff at Ross Roy Communications found us through the internet. His company was designing the Chrysler Corporation's information center at the Mall of America, near Minneapolis. He envisioned large holograms flanking the entrance to the display area, as a welcome to their visitors. briefly as the viewer passed the center perspective. 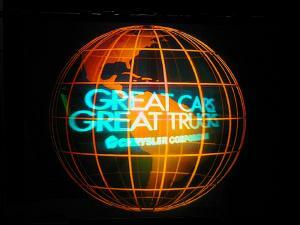 The slogan GREAT CARS GREAT TRUCKS would simultaneously grow and zoom forward out of the center of the globe, ending up wrapped around it, in deep blue. One of our computer modelers, John Douglas, created, animated and rotated the three models and put them in a Web site where Jeff could review them in his own office. For computer generated holograms, we use the STEREOGRAM process, which starts with a series of photographs. Each computer model was rendered 240 times, slightly rotated and animated from frame to frame. The renderings were then recorded onto 35mm photographic film, each 240 frame sequence on a continuous bulk roll. The photographic sequences could then be converted into the three color hologram, involving a two step process. HNI's large format stereogram printer performs the first step. The printer was designed, prototyped, and built by HNI in 1993. Using laser illumination, the printer records each photographic frame into a thin strip of holographic image, one after another, 'building' the hologram from left to right. This is a computer controlled, step-and-repeat process which takes about 10 hours. The result is a laser viewable MASTER HOLOGRAM, roughly equivalent to a negative in photography. Three masters were made, one for each color in the final hologram. The masters contain all of the image information, but are difficult to interpret. The display hologram, or TRANSFER, must now be made from the masters. To do this, all three masters were illuminated with laser light in HNI's transfer lab, to focus their images in space. The positions of the masters were carefully adjusted to register, or nest, the 3-D images inside each other. The new transfer hologram was then made right at that focal position, about 1.5 meters from the masters. This is literally a hologram of a hologram, the images from the masters acting as subjects for the transfer. After processing, the transfer hologram is viewable with an ordinary white light, or track light, and the images pop out in vibrant color and vivid 3-D, rotating and animating in response to your movements. At this stage, Jeff returned briefly to approve a test shot of the final piece. He requested a few minor changes in alignment and brightness of the images, and we finished two deliverable copies the next day. These holograms, produced on film, were then laminated to 1/8 inch clear acrylic sheets, packed into flat plywood crates, and shipped to Minneapolis for installation. Occasionally our services are requested at installation, but this is a simple process, and I urged Jeff to try it without our help. There was no problem. These holographic images are an example of good design with a clear sense of balance and meaning. The depth of 3D holography and animation are convincing and dramatic. Jeff reports that "the holographic image has become a focal point of the store and represents well the design and style of the environment."